Dilated cardiomyopathy (DCM) is a disease of the heart muscle that results in weakened heart strength and poor pumping ability. As the disease progresses the heart chambers become enlarged, predisposing a dog to secondary complications including congestive heart failure. DCM is most common in adult, large breed dogs. 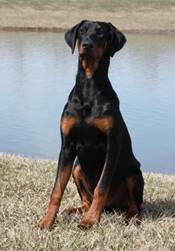 The cause of DCM is unclear in most cases but certain breeds have an inherited/genetic predisposition, such as Doberman Pinchers. DCM is less common in smaller breeds but has been associated with taurine deficiencies in Cocker Spaniels. There are often no symptoms early in the disease process (this is termed ‘Occult DCM’). As the disease progresses you may notice signs related to poor circulation and/or fluid retention. Early symptoms can be subtle and some owners report that their dog has ‘slowed down’ or does not want to exercise as much. Over time, more obvious changes develop including fainting/collapse episodes, frequent coughing, heavy/labored breathing, and an inability to rest or sleep comfortably. Some dogs accumulate fluid in their abdomen giving a pot-belly appearance (often mistaken for general weight gain). Dogs with DCM are also at risk for passing away suddenly even without previous symptoms. 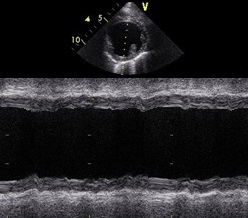 The echocardiogram is the gold standard for diagnosing DCM as it is the only test that allows a cardiologist to accurately measure the size and strength of the heart muscle. This is a non-invasive test that can be done without sedation. 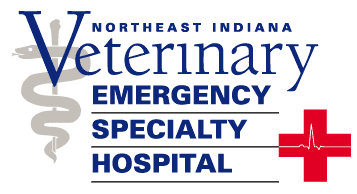 A cardiac exam by a veterinarian may detect abnormal heart sounds (soft murmur or arrhythmia) if present. Accurate diagnosis requires a combination of tests including an electrocardiogram (ECG/EKG) and echocardiogram (ultrasound of the heart). 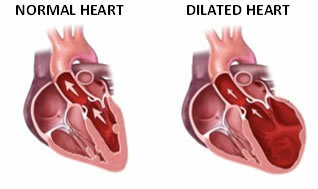 Many dogs will develop arrhythmias (abnormal heart rhythm) before heart enlargement develops. An ECG is a non-invasive test that allows veterinarians to evaluate the heart rate and rhythm. Small clips (electrodes) are placed on the legs and are used to make a recording that can be printed and analyzed. Alternatively, a 24-hour Holter monitor can be done to evaluate the heart rhythm over 24 hours. This can help give a more accurate diagnosis and is commonly used for screening in breeds with a higher incidence of DCM (Boxers and Doberman pinchers). Genetic testing is also available for Boxers and Doberman Pinchers through the NC State Veterinary Genetic Lab. It is important to remember that not all genetic markers of DCM have been identified; therefore, a negative test does not guarantee that your dog will be free of the disease. It is mostly used for breeding purposes to try and identify high risk dogs. Unfortunately, dilated cardiomyopathy is a lifelong disease that cannot be cured (except in rare cases of taurine responsive DCM). The goal with treatment is to maintain a good quality of life for as long as possible. This usually includes oral medications to improve heart function, control arrhythmias, and manage fluid retention. The exact medications used will depend on the stage of your pet’s heart disease (occult DCM vs. congestive heart failure).